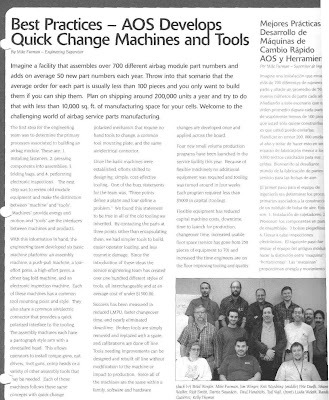 I worked in high volume manufacturing with AutoLiv in 2002 to help create Universal tooling and Manufacturing contract called for the implementation of four new manufacturing machines that would replace multiple outdated dedicated machines, negating the need for more floor space, maintenance support and increasing work flow process. In addition, the new machines required a sixty-second change out of tooling to run multiple manufacturing programs. 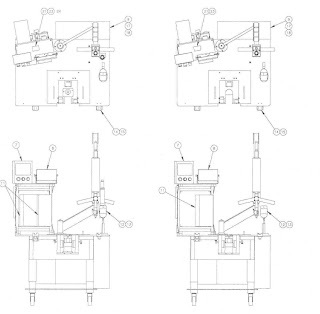 The design featured simple sixty-second change out of tooling using quick release pins, improved interface for both the ergonomics of the operator and the interface of the work piece for better control of the work piece, faster manufacturing rates, faster transition from one program to another and provided for versatility and for upgrades. 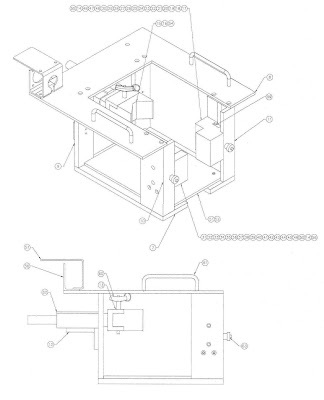 The primary manufacturing machine consisted of a simple clamping system with in a "nest" utilizing delron blocks cut to meet the work piece interface and apply manufacturing and fabrication appliances in a consistent fashion regardless of changes in the work piece.